In 1986 finding himself with some extra time between U2 projects, The Edge went looking for a soundtrack to work on. The result of that search was the movie “Captive”, to which he scored the movie with assistance from Canadian, Michael Brook. It is the first, and to date, the only time a member of U2 has produced a full solo album. While the bulk of the album was instrumental, a young Sinéad O’Connor was brought in to sing on vocals on one track, “Heroine”, and that song was released as a single to promote the soundtrack album. Sinéad had previously worked with In Tua Nua on a single “Take My Hand”, and who had been considered for lead singer of that band. However, being too young to tour at just 16 she was passed up for the lead in the band. The band would include Vinnie Kilduff who had played on U2’s “October” album, and Steve Wickham who would go on to play with the Waterboys, and who had worked on U2’s album “War”. In Tua Nua was initially signed on Mother Records, U2’s label in Ireland. 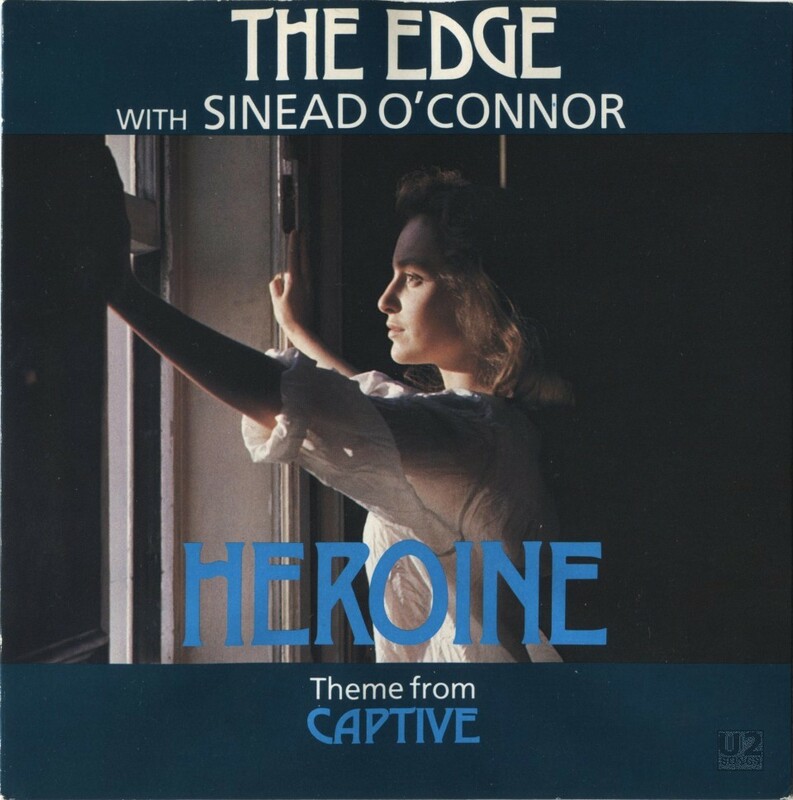 It was through these connections that The Edge found Sinéad and this is one of her earliest recorded songs, her own first single being released the following year. The song “Heroine” also includes Larry Mullen on drums. The single was released on 12-Inch and 7-Inch vinyl. The song entered the UK charts on October 4, 1986 at number 89. The cover of the vinyl is taken from the movie. The single featured the a mix called the 7” Version, as well as a second mix of the song “Heroine”. Upon close comparison there appears to be little difference between the version on the 7” single and that on the soundtrack album other than a few seconds of blank space at the end of the track. The song isn’t even labelled as a different mix on the 7” and instead labels it as “Theme from Captive” just like the soundtrack does. On both sources it is listed as being remixed by Steve Lillywhite. The second mix of “Heroine” adds a longer instrumental introduction, and fades out with Sinéad’s vocals still prominent instead of the instrumental ending found on the soundtrack. Written by The Edge. Vocals: Sinead O’Connor. Lyric: The Edge and Sinead O’Connor. Produced by The Edge with Michael Brook. Remixed by Steve Lillywhite. Written by The Edge. Vocals: Sinead O’Connor. Lyric: The Edge and Sinead O’Connor. Produced by The Edge with Michael Brook.